U.L. 1008 Listed (File No. 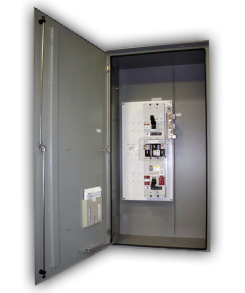 E32008), these Manual Transfer Switch are rated for applications of 100 thru 4000 amperes, up to 600 Vac with interrupting ratings of 35kAIC@480Vac thru 150kAIC@480Vac available. The Manual Transfer Switch (MTS) is a basic, manually operated, transfer switch with mechanical interlocking included. The interlocking mechanisms are located behind the molded case units and to the right side of insulated case units, to prevent accidental paralleling of the sources. Paralleling of sources is not an available option for a manual type transfer switch. The main function of a MTS is to provide cost savings to the customer when there is qualified personnel continuously onsite to operate this equipment should a power source fail. With the removal of any type of automatic controls, the equipment pairs down to a very complicated power switch at the required amperage and withstand ratings.